We survived the bird-day party without too many ruffled feathers. Oh sure, there were a few bonked heads and plenty of tattling, and some odd moments (like when a little girl locked herself in the bathroom with a hijacked doll stroller). But but what can you expect when you invite 14 kindergarten girls to your nest? All you can hope is that you will learn from the experience. Learn to never do it again. Ever. Maggie’s metamorphosis into a 6 year old wasn’t a total bust. 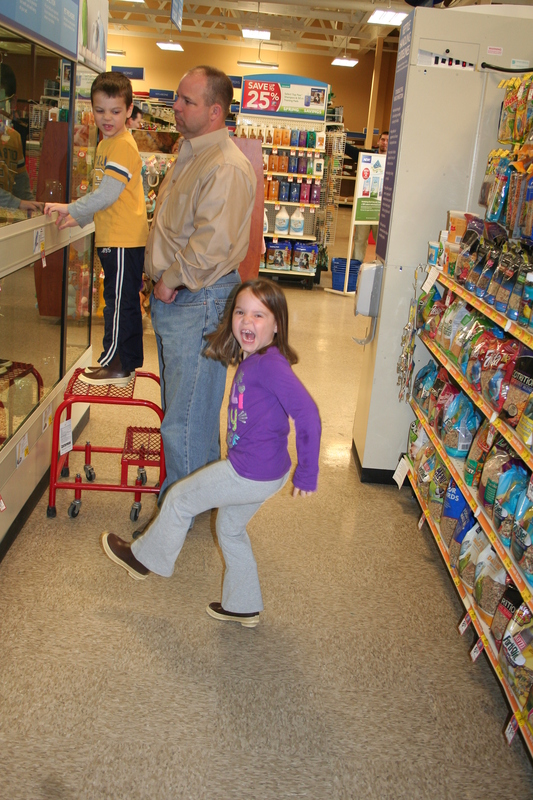 On her actual birthday, we swooped her up immediately after school and headed to a local pet store. Both of our kids like to watch the mice run on their little treadmills, pet the bunnies, and of course watch the birds. Little did she know a giant bird cage was awaiting her back at home, all wrapped and ready for her new feathered friend. “Maggie, do you really want a bird?” asked her dad. She nodded. Of course she did. This is how we express pure and utter joy! The blue girl is Sam’s – that’s Squalky. 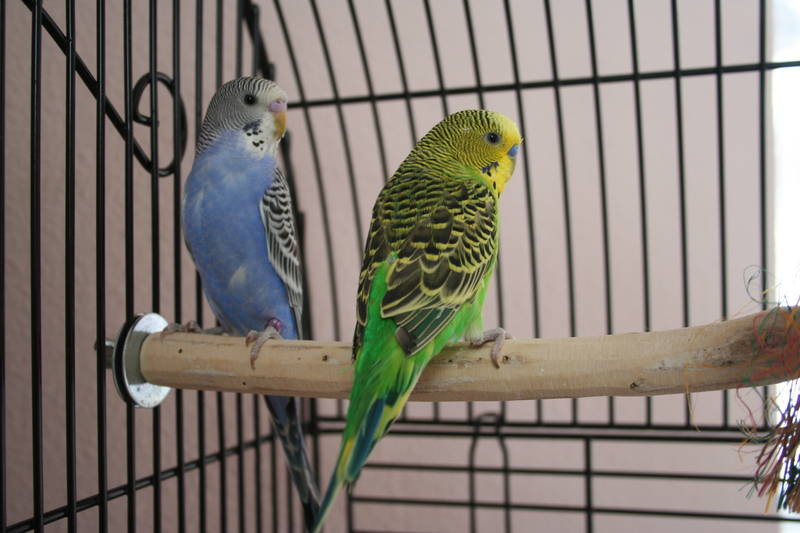 Maggie’s green boy was initially named “Heart” (because she loved him so much) but she has since changed it to Flutter. Our attempts to convince her that Gumby or Pickle would be better were rebuked. Bummer. Our family rule is the birthday person gets to pick dinner – any meal, any place. 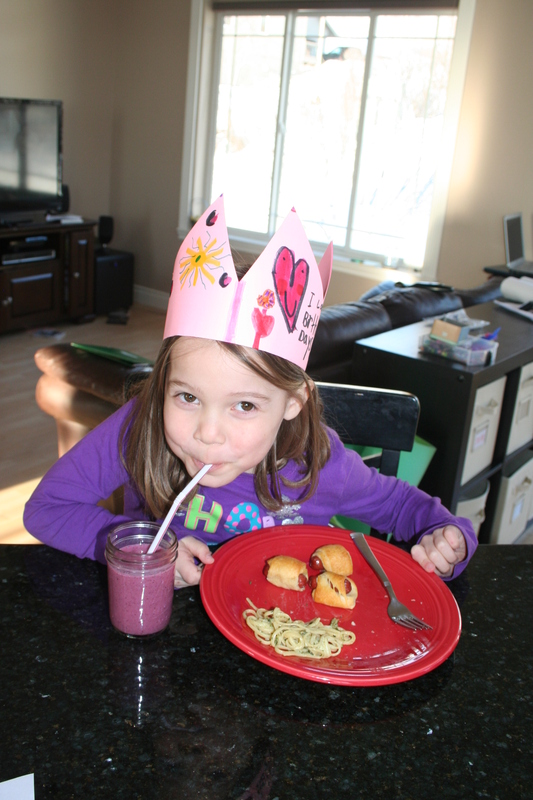 Of every available choice on the planet, Maggie’s dream meal was broccoli noodles, pigs in a blanket, and a fruit smoothie. 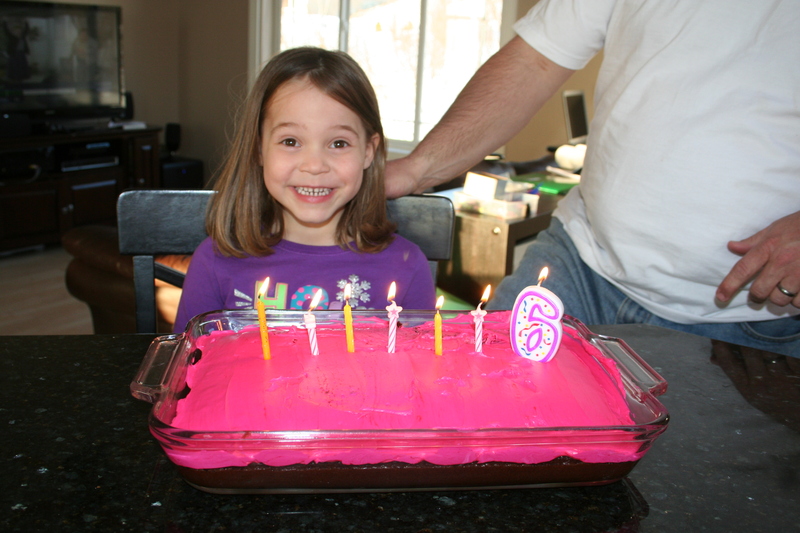 She also requested a chocolate cake with pink frosting. Oh, to be 6 again! So happy birthday to our brilliantly hilarious daughter who can be simultaneously maddening and joyous . We love you always, and are so proud of the kind girl you are growing to be! Next Next post: For the Birds: The Finale!